Literary giant Prof. Chinua Achebe has stirred the hornets’ nest, with his claim that war-time Head of State General Yakubu Gowon and the late Chief Obafemi Awolowo formulated policies that promoted genocide against the Igbo. On Chief Obafemi Awolowo, who was the Vice Chairman of the Federal Executive Council and Minister of Defence, Achebe said: “The wartime cabinet of General Gowon, the military ruler, it should also be remembered, was full of intellectuals, like Chief Obafemi Awolowo, among others, who came up with a boatload of infamous and regrettable policies. A statement credited to Awolowo and echoed by his cohorts is the most callous and unfortunate: all is fair in war, and starvation is one of the weapons of war. I don’t see why we should feed our enemies fat in order for them to fight harder’. Achebe’s views provoked anger yesterday. 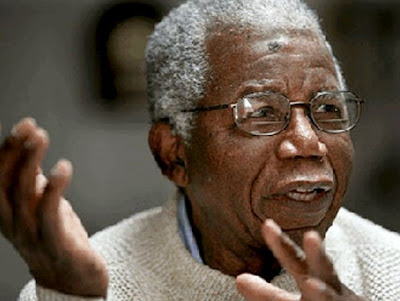 Reacting yesterday, Mr. Ayo Opadokun who was Assistant Director of Organisation of the late Chief Awolowo’s Unity Party of Nigeria (UPN) and later Secretary of the National Democratic Coalition (NADECO), described the Achebe assertion as “typical”. “It is a reharsh of the perverted intellectual laziness which he had exhibited in the past in matters related to Chief Obafemi Awolowo. When Achebe described Awo as a Yoruba irredentist, what he expected was that Awo should fold his arms to allow the Igbo race led by Dr. Nnamdi Azikiwe, to preside over the affairs of the Yoruba nation,” Opadokun said. Opadokun pointed out that some of his colleagues who played prominent roles in liberating Nigeria from the clutches of military rule, such as Rear Admiral Ndubuisi Kanu (rtd), Commodore Ebitu Ukiwe (rtd), Dr. Arthur Nwankwo, Alhaji Abulaziz Ude and others who he described as “men of honour and integrity”, are Igbo. But he found it difficult to believe that a scholar of Achebe’s stature could be so unforgiving. Senator Biyi Durojaiye shares Opadokun’s view. He said: “My view is that you don’t expect somebody on the receiving end of a war to say something pleasant about the winners. He urged the Igbo to be more charitable, seeing that both sides of the war are now benefiting from its outcome. He enjoined all to join hands in facing the challenges of the moment, insisting that the way to go is for all Nigerians to support a Sovereign National Conference and restructuring of the polity. Mr. Omosanya said he had expected that people intellectuals such as Achebe, would be bridge builders and avoid inflaming passions.